I've decided to start running a regular feature on my blog called Window Shopping - in which I write about beautiful things I have seen for sale, but can't really afford to buy. 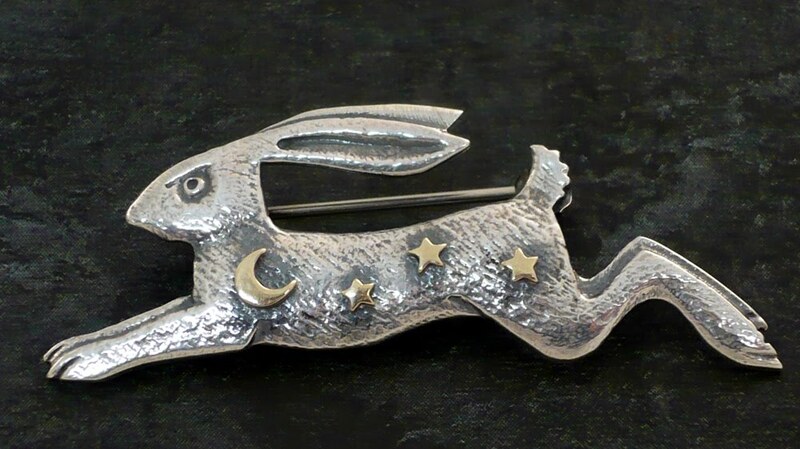 This lovely handmade silver brooch of a magical hare with a gold moon and three stars running across his coat is available from Iapetus. It costs £109 - which is probably very reasonable for the amount of work that had gone into making it, but nevertheless my budget only runs to window shopping at the moment. As window shopping goes, the Iapetus website is a great place to spend some time even if you don't actually spend any money. Lovely brooch, I love hares and the stories behind them. This reminds me of my Celestial Hare Pendant design on my SquareHare website or etsy site.